But to really sell a crisis, you need some numbers. Accompanying this was a graph credited to the American Academy of Arts and Sciences showing a spectacular collapse in humanities enrollments. I happen to have made one of the first versions of this chart working there several years ago. Although it shows up in the press periodically to enforce a story of decay, some broader perspective on the data makes clear that the "Humanities in crisis" story has the wrong interpretation, the wrong baseline, and the wrong denominator. The interpretation: The chart never quite reinforces the point that something terrible is going on in the humanities right now. Anyone looking at it closely will notice, as Michael Bérubé has, that the real collapse of humanities enrollments happened in the 1970s. The Great Recession has been less ruinous to enrollments than were the mid-1990s. Sure, a few Harvard majors have switched from history to government in the last decade: is that really a story? But it does succeed in making the humanities appear massively out of date. And that's a compelling story for all sorts of people. It makes humanists feel as though they deserve a larger share of the university, and that their sense of being under seige is due to the some pathology in the culture at large; it makes traditionalist critics of the humanities feel secure in pointing out that something has gone very wrong in the field. As for the baseline: the chart starts in 1967 because that's the farthest back point that the federal government has online computerized records of enrollment. But baselines matter, a lot. This graph is misleading as a statement about what the humanities should look like in American life, or even what they used to look like. 1967 is not when they started tracking enrollment numbers--it's just the point where it's extremely easy to make a chart without leaving your computer. A long time ago, I went through two decades of paper printouts from the Bureau of Education and copied by hand what enrollments looked like before 1967. If any period is a very strange abberation in the history of the American university, it's the 1970s, not the 2010s. 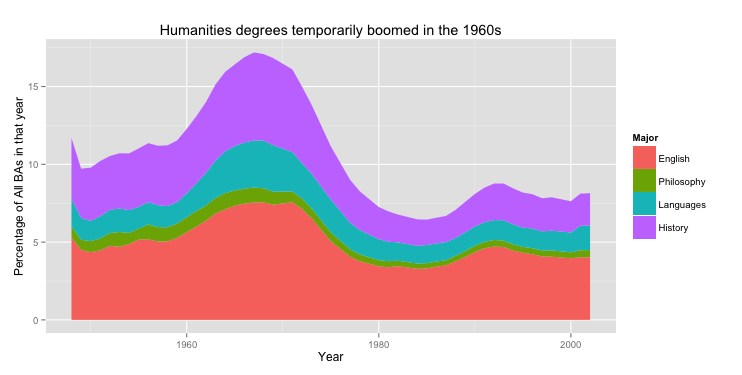 (It should be clear, but these are stacked--about 10% of all degrees were in the big humanities fields in the late 1940s). The WSJ chart starts at precisely the moment of highest enrollment. Degrees are, a bit, lower as a percentage of the university than they were in 1948: humanities were about 10% back then, and more like 8% in recent years. (These four majors form the vast majority of all humanities degrees--we're not losing much quantity by omitting music, Af-Am, and the rest. And I should note I'm speculating a bit about the total BA numbers before 1955 or so--they kept some first professional degrees lumped in, so I might be off by a percentage point or two. That's why this data couldn't be included in the official version of the Indicators, if I recall correctly). And "percentage of all degrees" is a strange denominator. Everyone knows that they quantity and type of American universities has been changing dramatically. Compared to the massive changes in the American university since the Second World War, it's the resilience of the humanities that should be surprising. If what you care about is humanistic education, you shouldn't be worrying about market share inside the university, which is a dramatically changing thing. You should care about the whole population. And while the 60s boom is still larger than anything we see today, that shows the humanities stabilizing in a fairly healthy place through the early 2000s. (I don't have the data after that on hand, but to repeat--there is no non-anecdotal evidence of a steep drop in humanities enrollments in the last 10 years). To see the data from 2002 to 2011, read my revised version of this post at Edge of the American West. A decline isn't a crisis. 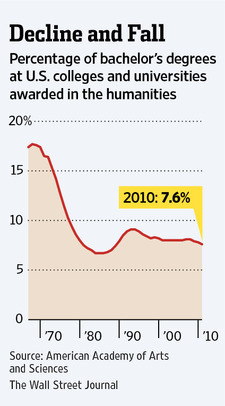 This chart also presents some big problems for all the pat stories we want to tell about the humanities. Look at the period of their great recovery: it's the late 1980s and early 1990s--in other words, the heart of the culture wars, perhaps the only period that everyone agrees was ruinous to the humanities. Should we conclude we need to get back to some deconstruction in our courses? That seems unlikely. We shouldn't be assessing the health of the humanities by market-share metrics that are far more about demographics and the changing face of higher ed than they are about the intellectual shifts at the heart of actual humanities practice. Talking about crisis doesn't help us. Humanists obviously get great pleasure from describing themselves on the knife's edge, but they're not especially effective at mobilizing the language of crisis to actually advance our fields. I suspect we're probably better if we don't buy into the narrative of collapse at all. More people are majoring in humanities fields. More books are being published in them. Whatever problems we have, they're not really about quantity. A fixation on corporatist measures of market share as representing the success of these fields is completely contrary to their aspirations. New enrollments in graduate programs are almost certainly not materially helping the field, but we too often act as if they are. 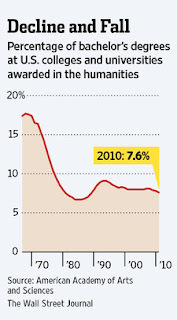 It's a non-story to say that the humanities are a minor but important part of the economy of the changing university. Everyone loves a narrative. But when someone tells you the humanities are collapsing, it's worth remembering that even the universities, not to even mention the country as a whole, have never been the bastions of humanistic learning we nostalgically invent. Thanks for this post. I do wish the data had music included, as I am/was a music major (and now PhD). I also wonder how minors are shifting... So many of the students I teach are science majors and communications or humanities minors (and especially music minors.) A few have told me that their parents wouldn't pay for them to major in music, but they would happily pay the way for their chemistry major. Fantastic post, Ben. Thanks so much for putting the data together. I think not just minors but interdisciplinary courses, as Jim Grossman says below, are probably quite important. There's some data on course taking, but it's not so detailed as degrees: I think, though I might be wrong, that minor requirements vary so widely from university to university that no one has tried to track them. Music is hard to track back into the 1950s, though, because there are number of conservatory or performance degrees (including non-BA ones) that are quite hard to disentangle. The American Academy's versions do have more majors included in the humanities--I've just found that these four fields tend to include the large majority of humanities degrees. Very useful. Thanks. There are a few stories to tell here. The dramatic decline in the early 1970 is probably attributable in part to the way other fields, especially the sciences, began to open up to women who were then less compelled to opt for a humanities major. That's a conjecture. One would have to look at the data more closely. If it's right, however, then there's another reason NOT to want to turn back the clock to humanities enrollments before the fall. Since the mid 80s, numbers have been fairly constant (except for the short uptick during the culture wars: no such thing as bad publicity). It's also clear that the number of humanities majors in all institutions or--even more so--as percentage of total population is pretty negligible, and has been so for a long time. That would seem to disprove overwrought claims that the humanities are the heart of the university or that they are indispensable for democratic citizens. The vast majority of citizens in this (and any) democracy don't major in the humanities. So is there really nothing to worry about? Not so sure. Harvard is, yes, just Harvard, but in this hierarchical society, what happens in the selective institutions, private and public, can have ramifications throughout the system. The humanities majors at Harvard and similar institutions have been historically higher than in the country at large, and they have indeed taken a plunge. In the short run, that won't mean much there. In the somewhat longer run, however, in the context of budget constraints, there will be resource reallocations away from low enrollment fields to high enrollment fields. For that reason it is important that humanities faculty pay attention to their enrollments and develop strategies to make their programs more appealing and, even, relevant to students. Russell Berman writes, "It's also clear that the number of humanities majors in all institutions or--even more so--as percentage of total population is pretty negligible, and has been so for a long time. That would seem to disprove overwrought claims that the humanities are the heart of the university or that they are indispensable for democratic citizens." The first of these sentences in no way disproves the "overwrought" claims outlined in the second sentence. Disturbingly, this post seems to conflate popularity/consensus with value/truth. We have quite enough of this kind of thinking in our society. @Russell: Some is gender shifts, although that cuts both ways (the percentage of college graduates who are female has been rising, and women have always been more likely to do a humanities major). A huge part of the shift in the 1970s is a rise in majors in fields like business and communications; and the transition of normal schools into what we sometimes call "Master's Colleges and Universities" really changes the landscape then too. I looked at institutional breakdowns quite a bit, years ago, and never felt like I completely understood the story. And of course, there are all sorts of majors (computer science, African American studied, biophysics) that simply weren't possible in the 1960s that are fairly common today. I could actually post the Harvard numbers somewhere, but at that scale it's not really worth it. Anecdotally: I, myself, am being counted as a social scientist because I majored in interdisciplinary "Social Studies" at Harvard, which involved, for me talking a lot of philosophy classes for my major evenly split between government, history, and philosophy. Over the short term, I think it's true that the history department has something of an enrollment problem. But the big picture has to do mostly with very arcane issues about where the line between the social sciences and humanities gets drawn. (History is actually a social science at Harvard, for instance). Vaguely apropos anonymous: I think arguments about what education is necessary for democratic citizenship need to revolve around high school education, not college. One can argue about what education is necessary for training future leaders, I guess, but that always seems quite presumptuous to me. This is also a reminder that as humanists our greatest potential influence on students is probably when we teach those who are major outside our departments. We need to stop thinking about such course as part of something called "general education," and instead think of it as our opportunity to impart humanities learning to large numbers of students. This is great, Ben. I hope the beautifully clear plots get widely circulated. Jim English looks at the same federal numbers and makes the same point in The Global Future of English Studies. He even has a note remarking that the abnormality of the 1960s peak and the danger of taking it as a baseline has long been remarked on by e.g. MLA's statisticians. He also underlines the importance of asking where the lost enrollments are going--there's some evidence that the marginal English major has recently been going to history (!) though it's hard to decide on an explanation. The big enrollments story, English argues, is actually long-term stability and growth, both in a US and a global context. Which makes the shift of resources away from teaching (by casualizing the labor force and ensuring that full-time instructors have not kept pace with enrollments) all the more outrageous and short-sighted. Thanks, Andrew. I didn't know about English's work, but I have seen the numbers show up occasionally in the history world as well. (I recall Tony Grafton, for example, talking about low 1950s history enrollments almost 10 years ago.) It's a real problem to get "The sky is not falling" into the breaking news. The point about casualization is important--crisis-talk is used to justify short-term exigencies that are actually long-term solutions no one would adopt outside of a crisis atmosphere. (See also the post-1975 PhD overproduction "crisis" that has persisted so long that there's hardly a professor left who didn't get a job after it started--but that's probably a whole different post). These are extremely helpful graphs--many thanks for this work. This overlaps nicely with the real message of Academically Adrift, which is that learning declines as one moves away from liberal arts and sciences (vs. the WSJ-type takeaway that no one learns much in college). If we assume that most students actually want to learn, there's a proto-explanation of why hum majoring has recently held up or even increased. our public grade schools also don't help much as far as whetting the mental appetite for an undergrad and post-grad exploration of the humanities. Public grade schools "teach to the test", and that's about it. Pray your high school has one or two truly inspirational and courageous teachers who teach outside the lines of the mandated text books and required readings. But save for the few and rare inspirational teachers, our public grade schools, and the underlying drive to make a six-figure salary, push young minds into only those fields in which there is the most earning potential. I think it is important to assess what we (as faculty, administrators, students, employers) want of the humanities. So much of the conversation has been about the decline of humanities majors and the need for departments to find ways to reverse these trends for the sake of preserving resources. But what about the greater role of the humanities within an institution? Ultimately how does the study of humanities disciplines fit into both the undergraduate and graduate programs of all fields? In my world at a flagship public research university, the priorities for humanities departments are ensuring that faculty have the time to publish and maintaining a vibrant graduate program, both in efforts to secure national rankings. This can only happen with financial support from the university, something that won't continue if undergraduate majors continue to decrease. So we play this endless game of chase the tail. What can we do that's new and different THIS year to attract more majors (and preserve the status quo?) It is time for a new paradigm to define the humanities. Hi Ben: I find your post extremely clear-headed and helpful. Thanks! However, I think that there are some important bits of the story that are still missed here. The charts above assume that a major in "English" is automatically a humanities major. However, what it means to major in "English" has also changed dramatically over the decades since the 1960s. The strong association between an major in English and the study of literature (in terms of historical development, internal structure or political/social resonance) has frayed. Separate "tracks" in Journalism, Creative Writing, Composition, Technical Writing, and other fields have made this association between "English" and "literature" harder to quantify. At many universities, students may complete a major in English with relatively little exposure to study in the humanities if "humanities" is taken to be connected to the cultural salience and structures of creative work with some emphasis on a sense of history. I'm not sure that simply rejecting a narrative of collapse or decline can make sense to faculty in departments with distinct literature programs or tracks -- in many places the numbers of majors in humanities programs are declining, not from a 1967 high but from numbers or 10 - 20 years ago and inter-departmental balances of resources are shifting. If funding for department hires, say, shifts from hiring literary theorist to hiring technical communications specialists, as we still talking about the humanities in any simple way? In writing this, I don't mean to sound hysterical (and regressive) like a Mark Bauerlein or someone -- but I do think that the optimism you reinforce above, while qualifying some of the most extreme examples crisis thinking, does not provide enough evidence for claims that humanists need to get over crisis thinking or stop indulging in the pleasures of describing ourselves as on a knife's edge. PS: Sorry my faculty page is blank! We're in the process of getting training in how to update them and I haven't been able to attend yet! I'm a Professor at Eastern Michigan University specializing in British Romantic-Era poetry. This is a really important point: I would have thought that "English" was about the only incontrovertibly humanities discipline (historians are frequently social scientists, and it's hard to argue that "humanistic values" are being taught in intro language classes or violin lessons). Humanities enrollments at elite colleges/universities where I teach are collapsing -- once highly popular courses are now barely enrolled. Parents of students at these schools won't allow their kids to major ("concentrate") in impractical subjects like German or religious studies. Harvard Social studies is an interesting outlier and a beautiful place to study -- a hidden humanities outpost in the midst of the social sciences that parents may find acceptable -- but is not very representative of this broader trend (I hope not, since I tutored there many years ago, and wish for its continued flourishing). I should be clear I'm talking about degrees, not enrollments for courses. And though I don't know where you are, I've heard some concern about declining enrollments at Princeton as well. But I really do think we tend to overplay these concerns, and certainly to ascribe them to wrong areas. Even a required introductory course like Harvard's CS-50 (introductory computer science) has wild swings in enrollment (336 to 96 from 1996 to 2002, and back to 320 in 2011). I don't think we gain much by panicing every time one of these swings happens in the humanities. But, I should also say the the enrollment numbers I have stop in 2011; that means there's very little room to see if the whole universe of education changed in the financial crisis. It's possible it did.